Columbia on iTunes U delivers academic audio and video to students, faculty, and the public through Apple's popular iTunes application. This service allows faculty to publish and manage collections of course lectures, course-related media files, and campus events that students can access anytime. This content can also be accessed on iPod, iPhone, iPad, and Apple TV. The Columbia Center for New Media Teaching and Learning manages the Columbia on iTunes U service and provides faculty support to educators at the University, as well as administrative access to schools and departments. *24/7 access to educational audio and video for student use. *Original content created by Columbia faculty, schools, and departments. *Podcasts of conferences, seminars, lectures, and other campus events. *Audio tours of the Columbia University campus. 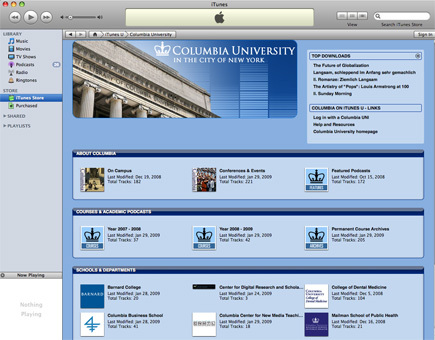 Columbia on iTunes U is accessible through the iTunes Store, and can be located in the directory of universities and colleges within the iTunes U section of the store. If you do not have iTunes installed on your computer, visit Apple iTunes and download iTunes for Macintosh or Windows. Visit Columbia on iTunes U. Select "Public iTunes U" for free collections of educational content, or "Restricted iTunes U" for content that is available to all Columbia students. Contact an educational technologist to learn more about Columbia on iTunes U and podcasting for educational purposes by emailing ccnmtl-itunesu@columbia.edu.